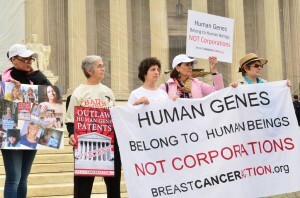 BCAction members rally at the Supreme Court to protest the patenting of human genes. Many of you celebrated with us this summer when the Supreme Court ruled in our favor. For those of you who have not heard about this win, thanks to our incredible team at the American Civil Liberties Union (ACLU), BCAction was victorious in our lawsuit against Myriad Genetics challenging the legality of human gene patents. Now that the Supreme Court decision is behind us, our work to ensure that women have access to accurate and affordable BRCA 1 & 2 testing continues. The Supreme Court ruling invalidated one company’s monopoly on this potentially life-saving genetic testing, and we were pleased to see other companies immediately enter the market offering lower-cost BRCA tests. As the watchdog of the breast cancer movement, we’ll continue to monitor BRCA tests that come on to the market to ensure they are affordable, well validated, contribute to open access medical research databases, and include genetic counseling before and after testing. Myriad has continued to throw its weight around, filing lawsuits against some direct competitors, even after the Supreme Court ruling. According to several legal experts, Myriad’s suits have no legal merit, yet that doesn’t seem to bother Myriad. They will stop at nothing (including setting loose a giant legal team to bully and intimidate the competition) to try to retain a monopoly on the “breast cancer genes” as long as possible. Myriad has asked for a court injunction that would stop competitors from releasing their own versions of the test while this new suit moves forward. Recently, BCAction worked with the ACLU and filed an amicus (friend of the court) brief in one of the cases as we believe that such an injunction would not be in the public’s interest. We expect the judge’s decision on this at any time. The first FDA-approved drug for the neo-adjuvant (before surgery) treatment of breast cancer was approved on September 30, 2013. Pertuzumab, trade name Perjeta, manufactured by Roche Pharmaceuticals, was previously granted FDA approval in 2012 for treatment of metastatic HER2-positive breast cancer. This new approval, granted under the accelerated approval program, is intended for women with early stage HER2-positive breast cancer who have tumors greater than 2cm or with positive lymph nodes. Perjeta is intended to be used in combination with Herceptin and other chemotherapy drugs prior to surgery. Under the FDA’s accelerated approval program, patients have access to promising treatments while drug companies conduct ongoing clinical trials to verify a drug’s efficacy, safety, and long-term outcomes. The confirmatory trial is still underway with Perjeta in the neo-adjuvant setting. The results are expected in 2016. Although the use of drugs during the neo-adjuvant setting often appears promising, Breast Cancer Action is advising caution as data still has not shown that pathologic Complete Response (pCR) necessarily translates into overall survival. There is no way to know, as of now, if tumor shrinkage/elimination will translate into women actually living longer, with a better quality of life. Only overall survival data can provide this information. We support the approval of Perjeta with only the pCR data in the neo-adjuvant setting because existing data on this drug in the metastatic setting shows Perjeta does improve overall survival and has low toxicity. We would be less supportive if this data were not already available. Although BCAction agrees that having Perjeta for use in the neo-adjuvant setting adds a reasonable option for women with HER2+ breast cancer, we will continue to uphold our standard that newly approved drugs must be backed up with solid clinical data that demonstrate the drug extends life, improves quality of life, and/or costs less than drugs currently on the market. BCAction we will be waiting for the confirmatory data on Perjeta, and watching very closely as other drugs come up for review for use in the neo-adjuvant setting. To read more on BCAction’s take on Perjeta click here. The largest annual symposium on breast cancer will be meeting from December 10 -14, 2013 in San Antonio, TX. If you’re planning on attending be sure to stop by the Breast Cancer Action table and say “Hi” to BCAction staff and volunteers. Executive Director Karuna Jaggar and Information and Resources Liaison Zoë Christopher will both be attending sessions, bringing our voice, and talking with women concerned about breast cancer. There’s always lots of news and information to report about treatments, issues, and controversies. Follow our live reports via Twitter (@karunajaggar and @BCAction), and look for our reports and analysis in future blogs, Facebook posts, and the next edition of The Source. ← Think Before You Pink® 2013 Campaign Recap: Toxic Time Is Up! Think Before You Pink® 2013 Campaign Recap: Toxic Time Is Up!